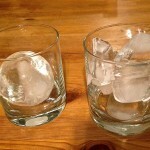 According to the great book on bartendering “The Fine Art of Mixing Drinks” by David A. Embury, first published in 1948 there are in total 6 basic cocktails and most of the other major cocktails are spinoffs of those. Before we go in to detail on the basics of those cocktails and their spinoffs we need to review the essential for a successful home bartendering. 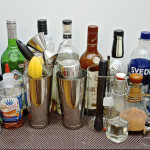 The Tools: There are four essential tools you will need for an effective home bar. A shaker. A simple shaker preferably stainless steel. I actually use the bottom part only, and for the top I am using a simply glass. I find that the top part although it firmly binds on the actual shaker it does not give the mechanical method to open it. So go with the bottom part and a glass. That is shown in the picture right next to the regular shaker. For the record it is called Boston shaker. You will also need ameasuring shot glass. The one shown in the picture is 1 oz. and 2.5 oz. on the other size. 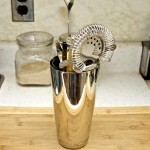 You will also need a stirrer long enough to reach the bottom of the shaker. You will also need a strainer. 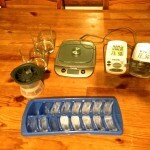 I use a regular strainer to strain the ice and the other stuff. I use a straining spoon. The spring one although it fits nicely in the stainless steel shaker it is hard to clean, and it is not so much more effective compared to the other one. Besides I am using an old straining spoon that I had from a cooking set. Finally you need a bottle opener. I have one for beers and one separate for wine. The wine one is not for cocktails and the sharp tip is kinda dangerous. Please avoid the sets. They look nice but it is hard to find a set with all the functionalities. The drinks: Aaaah the drinks… Well you need drinks but unless you plan to have a big party just make sure you have the essential. Towels: Well you need at least one to pat dry your hands. If not you will nasty finger prints on the glass. Extra stuff: A knife to cut lime, lemon and oranges, a jar with cocktail onions, a jar with green olivesand a jar of maraschino cherries. Also get straws and if you plan a party make some fresh, strainedlime juice (not form the store!). Also prepare a simple syrup in a bottle by boiling for 5 minutes 2 cups of sugar and a cup of water with a slice of lemon. 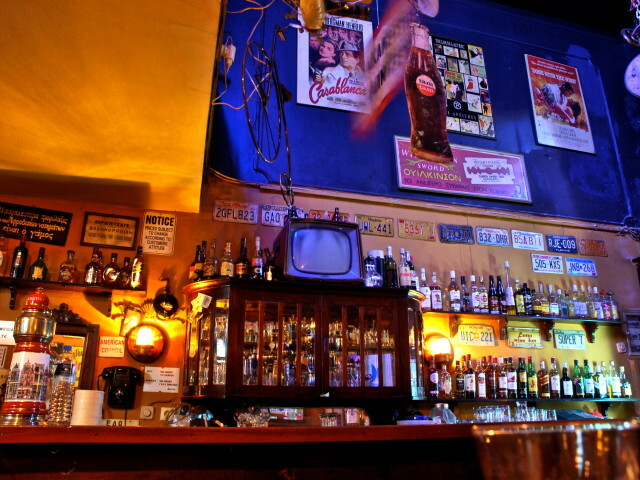 Get those essentials and you are 90% ready to have a professional bar. With those you can make all the basic cocktails their variations. And you can have endless nights of fun. Just don ‘t do it to much.